We had a huge, dead oak in our backyard that had to be taken down last fall before we had our fence put up. 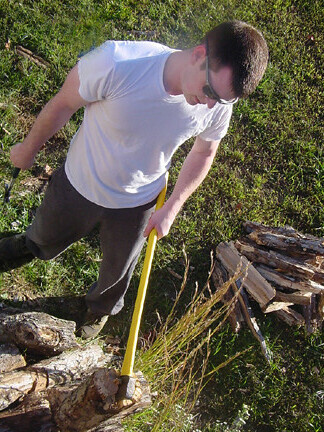 He's been chopping some of the smaller pieces for firewood, and I told him he should make something out of some of the bigger logs (I'm talking BIG). You know, to honor the tree and all that. And also so I have more pretty things for my house. Erin: Why don't you look up online how to make something out of oak from your backyard? Noah: I know! I could buy that book I saw on carving wizards. Noah: We could set up a wizard enclave around the fire pit.